For wood posts. Extends wire 1" from post. 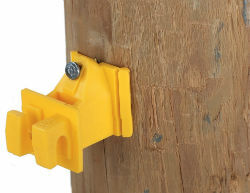 Flexible base fits round and flat sided posts. Single headed nails supplied, easily removed. Molded of high density polyethylene with UV inhibitors. Complete with nails.